Over/Under: Under 151.5 at 1.90 Bet Now! The hosts have lost three games in a row and this has been a horrible season for the Catalan club. The fact that they are coming up against their former coach in Xavi Pascual on Friday night is no relief and this is likely to be another difficult night for the home team. This is one of the classic clashes in the Euroleague and this game sees these two giants clashing for the 11th season in a row! When it comes to Euroleague history, these teams know it all including meetings at the 2012 Final Four and the 2011 and 2013 Playoff round. The hosts are currently 17-9 in the overall record against their Greek opponents and they will be desperate to keep this run going. In recent laches, the Catalan club hold the upper hand, winning 9 out of the 10 most recent outings. This season has been a strange one for Barcelona, the level of injuries the club has been dealing with has been monumental and they have struggled badly. However, last week saw the return of Justin Doellman and Victor Claver and we may finally get to see the Barcelona of old before too long. Tyrese Rice has been a big player for the Catalonians, offering an average of 16.4 points per game and an average of 4.8 assists per game. Ante Tomic has also chipped in but his record of 7.6 points per game indicates that Barcelona are lacking firepower. The away team come into this game with a 5-4 record and a lot of this is down to the success of Nick Calathes who has had a great all-round season. He has delivered an average of 13 points per game, 5.7 rebounds per match, 7.6 assists per game and even 1.6 steals per game. This all-round level of performance has been of great benefit to the hosts. A boost to the Greens comes with the fact that Mike James is coming back from injury and the away side has notched an average of 80.9 points per game this season. 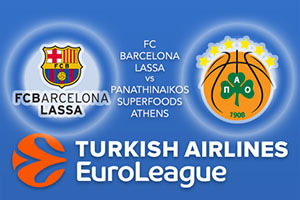 Take Panathinaikos at +4, available at odds of 1.90. For the Over/Under market, look to go UNDER 151.5 which you can find on offer at odds of 1.90. Bet Now!